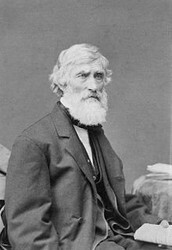 "Asher Brown Durand." Encyclopedia of World Biography. Detroit: Gale, 1998. Biography in Context. Web. 1 Dec. 2015. Avery, Kevin J. 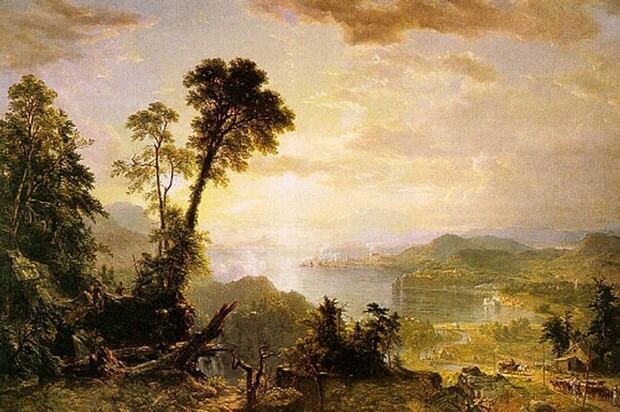 "Asher Brown Durand (1796–1886)". In Heilbrunn Timeline of Art History. New York: The Metropolitan Museum of Art, 2000–. 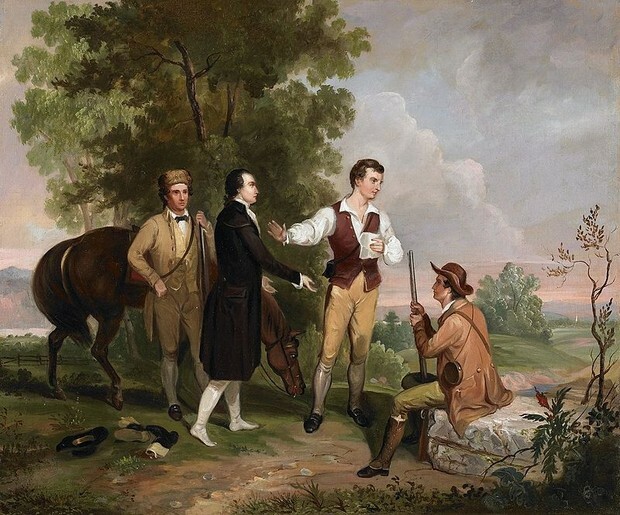 This painting depicts a scene in which militiamen in Tarrytown, New York, detain Major John Andre during the American Revolution. Andre was “…a British spy hanged during the American Revolution for assisting Benedict Arnold’s failed plot to surrender the fort at West Point, New York, to the British Army.” He was eventually hanged, but accepted his death with dignity, and figures such as George Washington complimented him (calling him things such as “accomplished” and “gallant”) while still arguing his death was fairly justified. (Birmingham Museum) Today, Benedict Arnold is famed for his betrayal to the United States, and is considered an enemy to the American Cause. Anybody who aided would surely be seen in the same way, and therefore this painting is a celebration of American victory. However, the fact that some level of respect was shown towards Andre is significant. Durand did not choose to paint a propaganda-like scene of a random Loyalist that was tarred and feathered; he depicted a worthy adversary, almost making this detainment more impressive. This could represent the growing Nationalism in the United States as well. This engraving, while a copy, still represents the growth of nationalism in the United States. 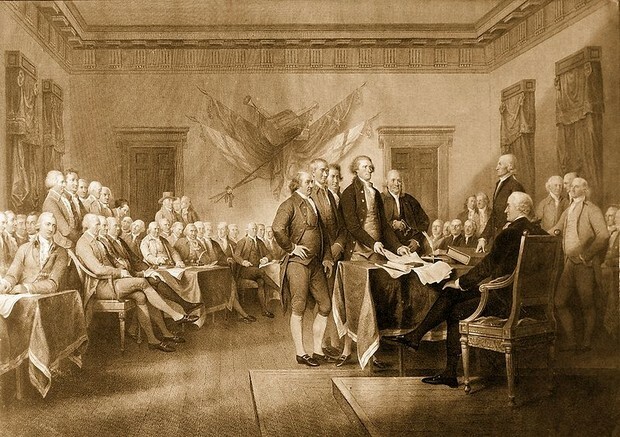 The original painting was commissioned in 1817, over forty years after the Declaration of Independence was signed. The patriotic motives in this piece are rather evident. The document is one of the most significant in American history- it is the means by which we became a nation. It is a significant moment of triumph for the colonists, and the anniversary of the signing is arguably the most patriotic day of the year. This painting depicts the contrast between the nation known to the Native Americans and the nation that is beginning to develop during this time period. On the left, Native Americans are seen looking on to a scene from higher-elevated wooded area. On the right, it appears as though people are migrating (presumably West) and modern technology like the telegraph wires is seen. The title itself is one that exhibits American pride- “progress” has been the driving force behind changes in the American society. 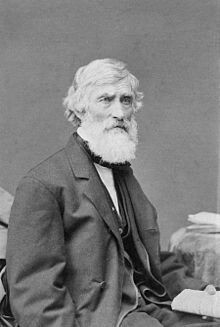 Settlers migrating represent the Manifest Destiny Americans were fulfilling. The beautiful landscape portrays God’s beautiful land that citizens were now free to take advantage of. The Native Americans in this image are not threatening or angry, rather they are peacefully observing the events taking place, as though they are accepting of the new fate of the nation.